Sometimes summer break can be even more stressful than when the kids are in school. There's the constant question of "What are we going to do today?" first thing every morning. There's the bickering between siblings that are now spending A LOT more time together. And there's the lack of time spent in quite all to myself. Don't get me wrong I'm not complaining, I enjoy having the kids both home. It's nice having someone to talk to during the day, and do things with. But I still enjoy those moments when they both want to go do something with a friend so I have a little time to myself to relax. What do I do with that time you ask? Well I'll be honest, it's not get that extra bit of cleaning done. I like to use my time wisely as I call it by doing something relaxing to relieve my stress a bit. I enjoy doing things like reading, coloring, and painting. They give me an outlet and something I can do all by myself. It's actually quite refreshing and then when the kids are both back home going at each other I'm able to approach it in a whole different mood. One thing I recently started using was this Stress Less Paint-By-Number Flowers Kit. I like it because it had everything in the kit that I needed to get started. And it reminds me of the old paint-by-number kits I did growing up. I'm one that sometimes struggles with using the adult coloring books because I don't know what parts to color with which color. This awesome kit has it all laid out for me, no need to stress over coloring it the right color! With more than two dozen flower illustrations, you can choose from lilies, zinnias, daisies, sunflowers, bluebells, and more, then follow the color selection instructions and unwind. You don't have to worry about picking the wrong color, or blending the wrong shade. This carefully curated, soothing palate ensures each piece you complete will be frame ready. 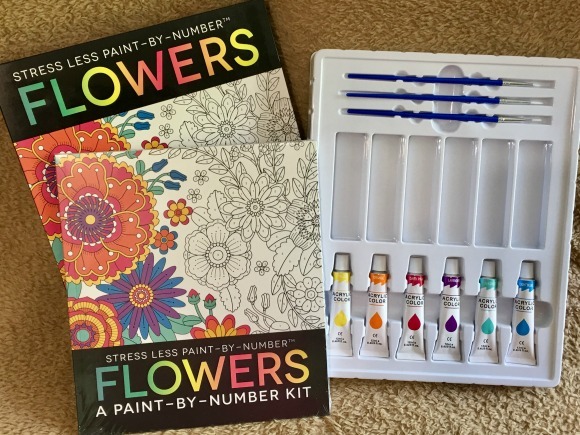 Win it: One lucky reader will win a Stress Less Paint-By-Number Flowers Kit. This giveaway will end June 29 at 11:59 PM EST. The winner will have 24 hours to respond to my email. If no response, a new winner will be chosen. Prize fulfillment will be made by the sponsor, I am not responsible for prize delivery or lost or stolen deliveries. Open to residents of the US. My favorite way to destress is to read. My favorite way to destress is to lock my bedroom door, go in my bathroom and soak in a soapy warm tub with the music on so I can not even hear knocks on the door. Dito. A warm bath always does the trick for me especially with soft music. A walk by the lake. I like to play with my grandson, take a walk, or bake! My favorite way to de-stress is to read. In the fall, winter and spring I like to cuddle up by the fireplace reading a good book. During the hot summer I like to sit on the deck watching the birds and animals. i like to color and listen to music. My favorite way to de-stress is by cleaning ceramic greenware and listing to soft music. I love to run, do crafts, and sew to de stress! To de-stress, I like to read a good book or go for a long walk. I listen to a calming daily meditation podcast in bed before I fall asleep. To sit with a cup of coffee and catch up on a tv show. I'd have to say my favorite way is to get lost in a book and go on a little vacation in the story ;) I have tried coloring also. It would be nice to try my hand at painting by numbers too! Quilting is my go to destresser. Going outside or taking a yoga class helps me to destress. I love to color to de-stress! I like to craft and color to distress. I like to de-stress by taking an hour nap or reading a book. Thanks. I distress by doing yoga or reading. I like to go for a walk or watch a movie. I love to read or color or play silly video games to de-stress.I would love to try painting though. Courtney Hennagir on rafflecopter. I get on my computer and just play a few games. I love relaxing in my rocking chair on my porch! I destress by reading a book. Reading, coloring, getting a manicure, meditating, yoga!